Copyright © 2014 NH. et al. This is an open access article distributed under the terms of the Creative Commons Attribution License (http://creativecommons.org/licenses/by/2.0), which permits unrestricted use, distribution, and reproduction in any medium, provided the original work is properly cited. Ischemia-reperfusion of cardiac tissues may lead to a prominent damage of the myocyte through either necrosis or apoptosis that seems to be the predominant modes of death during this period. In this study, we investigated the effects of L-Methionine in regional ischemia/ reperfusion injury and apoptosis. Dwale-sprague rats were divided into four groups (six rats per group). Sham group, rats were subjected for all surgical procedure without ligation of the left interior descending coronary artery (LAD). Control group, in which LAD was ligated. Control vehicle and L-methionine treated groups, rats pretreated with normal saline and L-methionine (100 mg/kg, IP ), respectively, for 7 days then subjected to the surgical procedure with ligation of LAD for 25 minutes followed by 120 minutes reperfusion. At the end of reperfusion, cardiac tissue TNF-α, IL-1β, IL-6 and ssDNA, as well as plasma cardiac troponin I (cTnI) were measured. It has been found that L-methionine treated group showed significant reduction (P˂0.05) in TNFα, IL-1β , IL-6, ssDNA and cTnI with respect to the control groups. Histopathology study revealed that the treatment with L-methionine significantly (P˂0.05) improved cardiac injury as compared with control groups and the total severity scores showed that the cardiac injury was mild (score 1) in 50.0%, moderate (score 2) in 33.3% and sever (score 3) in 16.7% of L-methionine treated group. It is concluded that L-methionine reduces inflammatory reaction associated with ischemia/reperfusion injury induced by LAD ligation in addition to its reduction for cardiac injury induced by ischemia reperfusion. Myocardial ischemia can defined as a state of imbalance between myocardial oxygen supply and demand. This imbalance may be caused by a reduction of blood flow and oxygen supply secondary to increased coronary vascular tone, intracoronary platelet aggregation, thrombus formation, increase heart rate, or microvascular dysfunction . Damage of cardiac cells occurs because of cutting blood flow to the heart and restoration it to myocytes in a state called ischemia reperfusion (I/R) injury . Thus, reperfusion can cause further injury to the myocardium and act like a “double-­edged sword” . It is accepted that the production of reactive oxygen species (ROS) plays an important role in the development (I/R) injury in cardiac cell. (I/R) also have been found to induce myocytes necrosis and apoptosis that seem to be the prevalent modes of cell death during the ischemic period and the reperfusion . Apoptosis is a regulated form of cell death that can potentially be a good approaches for therapeutic intervention to stop the loss of cardiac cells; experimental studies have shown that apoptosis arises as a widespread feature in cardiac diseases like ischemic heart disease and congestive heart failure . Methionine is an essential amino acid plays a significant role in many intracellular processes. These include: the synthesis of protein molecules where it act as an initiator, the synthesis of S-adenosyl-methionine (the main intracellular methylation agent), and polyamine synthesis. In many cells and tissues, methionine can be converting to cysteine, a substrate for the synthesis of the main intracellular antioxidant, and glutathione . The materials used in this study are pure L-methionine powder (Santa Cruz Biotechnology, USA), ketamine (Hikma, Jordan), Xylazine (RompunTM, 2% vials, Bayer AG, Leverkusen, Germany), ethanol (Fluka, Switzrland) and normal saline (KSA). Rat tumor necrosis factor-α (TNF-α), interleulin-6 (IL-6), interleukin-1 beta (IL-1β) enzyme linked immunosorbent assay (ELISA) kits were purchased from Sigma, USA. Rat cardiac troponin I ELISA kit was purchased from Life diagnostics Inc., USA. The instruments used in this study were High Intensity Ultrasonic Liquid Processor (Sonics & materials Inc., USA), Vascular Clamp (Biotechno, Germany) and ventilator (Harvard. USA). Thirty dwale-sprague male rats where enrolled in this study. The animals were obtained from the animal house in Kufa medical college. Their body weight ranged from 150 to 200 gram. The rats were housed in cages and kept at 25˚C and artificial 12-hour light-dark cycle .Animals had free access to drink water ad libitum and was left for two weeks without interference for acclimatization. Animals had no manifestation of any illness upon examination. Animals were randomly divided into four groups ( six rats/group) assigned as I, II, III, IV, Group I (sham): Rats were subjected for all surgical procedure without ligation of left anterior descending(LAD) coronary artery. Group II (control): Rats were subjected for entire surgical procedure with ligation of (LAD). 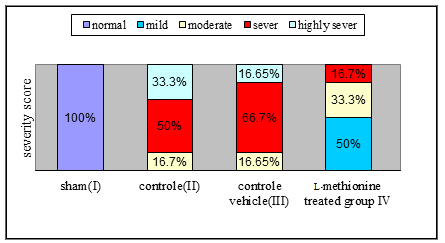 Group III (control vehicle): Rats were pretreated with normal saline (vehicle for L-methionine) for seven days then subjected to entire surgical procedure with ligation of (LAD). Group IV (L-Methionine treated group): Rats were treated with (100 mg/kg) IP L-Methionine  then subjected to entire surgical procedure and ligation. Rats were anesthetized with 80 mg/kg ketamine and 8 mg/kg Xylazine . When the animals became unconscious (within 5-10 min), they were placed in supine position with their limbs fixed with stickers to ensure their immobilization during surgery and head extended with traction suture attached to the upper incisor teeth. Hair in the neck and chest regions was shaved and the skin was sterilized. All operative procedures were carried out in clean conditions. Longitudinal nick incision was made; trachea was reached by removing salivary glands via simultaneously pulling each part sideward with forceps. With the same maneuver, the paratracheal muscles on the midline fascia were split to expose the trachea in the larynx area with stay sutures applied to each side of split strap muscle. The trachea was intubated with a cannula sized either 22 G or 20 G according to the weight of animal with the small catheter reserved for the smaller animal. Mechanical ventilation was then achieved by connecting the endotracheal tube to scientific ventilator supplied with 100% oxygen at a respiratory rate of 50/min with a tidal volume of 20 mL/kg body weight . Once steady breathing is established, animal׳s left limbs were fixed with right side limb, left thoracotomy was made between the 3rd and 4th rib and pericardiotomy was performed by using hemostats or round end scissors to open the space, without cutting the tissue so that the risk of bleeding can be reduced. A chest retractor was positioned within the fourth intercostal space in order to spread the ribs so that the left ventricle (LV) is exposed. Maximal care was taken not to damage the lung. A wet piece of small gauze, soaked with normal saline was inserted into the thorax to push back the lungs away and expose the heart. To have a clear view, the pericardium was removed using electronic microscope and LAD was easily detected. The LAD was transient ligated using a 6-0 prolene suture for a 25-minute ischemic period without exteriorization of the heart . The rate of ventilator gradually was decreases. When spontaneous breathing was sufficient, decision was made for gentle and careful extubation after freeing the rat from tapes. Finally, the rat was transferred into clean cage oxygenated with 100% oxygen and placed near a heating lamp. Cardiac reperfusion was allowed following 120 minutes of the LAD ligation . Microsurgical scissors are used to cut the knot in the ligature. Proper ligation of the LAD was confirmed by observing blanching of myocardial tissue distal to the suture and dysfunction of the anterior wall as observed during the transient LAD ligation. Reperfusion was verified by the return of red color to the myocardial tissue and the demonstration of some recovery of anterior wall motion observed immediately following the transient LAD ligation. At the end of reperfusion, blood was collected from the ventricles at the apical side. Hearts were cut from their main arteries (aorta and pulmonary artery), rinsed with normal saline to remove any blood, and stored in deep freeze (-20˚C to -80˚C). The ventricles were cut from the atrioventricular junction and divided into two parts, lower (apical) and upper parts. The apical parts of the heart was further divided into two parts, one part used for apoptosis study while the other part was fixed in 10% formalin and processed by routine histological methods and embedded in paraffin blocks . For subsequent histological examination, 5μm-thick horizontal sections were cut and stained with haematoxylin-eosin (H&E). The upper parts of the ventricles were washed with cold normal saline to remove any blood, stored in deep freeze (-20˚C), and then homogenized with high intensity liquid processor in 1:10 (w/v) phosphate buffered saline that contain 1% triton X-100 and protease inhibitor cocktail . The homogenate was centrifuged with 2,500 g at 4˚Ċ for 20 min. The supernatant was collected and used in TNF-α and IL-1β and IL-6 determination. At the end of reperfusion 2 ml blood was collected from the apex of the hearts. Blood samples were placed in a disodium EDTA (22 mg/ml) containing tube, mixed thoroughly and centrifuged at 3000 rpm for 15 min. This procedure is based on the selective denaturation of DNA in apoptotic cells by formamide, and detection of denatured DNA with monoclonal antibody to single-stranded DNA (ssDNA). Formamide is a gentle agent that denatures DNA in apoptotic cells, but not in necrotic cells or in the cells with DNA breaks in the absence of apoptosis. The part of ventricular sample that used/ for measurement of apoptosis level were lysed using trypsin. Trypsin is a serine protease commonly used for detachment of adherent cell lines and dissociation of tissues in a concentration range of 0.025 % to 0.500 %. Incubating cells (tissue) with high trypsin concentration for extended time-period will damage cell membrane and kill the cells. For the dissociation of tissues, trypsin has been used alone or as a supplement to other enzymes. Statistical analyses were performed using SPSS 20.0 for windows 7 (IBM, USA). Data were expressed as mean±SEM unless otherwise stated. One way Analysis of Variance (ANOVA) was used for multiple comparisons among all groups. Pearson correlation coefficient was used to assess the associations between two variables of study parameters. In all test; P˂0.05 was considered statistically significant. The levels of plasma cytokines (TNF-α, IL-1β and IL-6) were found to be significantly elevated (P˂0.05) in control group (II) and control vehicle (III) compared with sham group (I). 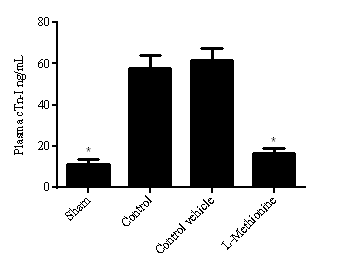 At the same time, cardiac cytokines were significantly decreased (P˂0.05) in methionine treated group (IV) with respect to both control and control vehicle groups, (Figure 1). The level of plasma cTnI was also significantly increased (P˂0.05) in control group (II) and control vehicle (III) compared to the sham group (I). On the other hand, cTn-I was significantly reduced (P˂0.05) in L-methionine treated group (IV) with respect to both control (II) or control vehicle (III) groups, (Figure 2). Exposure of myocytes to ischemia/reperfusion injury through LAD ligation significantly increased the ssDNA levels (P˂0.05) in the control group (II) compared to the sham group. Pretreatment with L-methionine (group IV) significantly reduced (P˂0.05) ssDNA levels when compared to the control group (I) and control vehicle group (II), (Figure 3). Figure 1. The levels of cardiac cytokines (TNF-α, IL-1β and IL-6) were found to be significantly elevated (P˂0.05) in the control group (II) and control vehicle (III) compared with the sham group (I). At the same time, plasma cytokines were significantly decreased (P˂0. 05) in methionine treated group (IV) with respect to both control and control vehicle groups. Figure 2. The level of plasma cTnI was significantly increased (P˂0.05) in control group (II) and control vehicle (III) compared to the sham group (I). On the other hand, cTn-I was significantly reduced (P˂0.05) in L-methionine treated group (IV) with respect to both control (II) or control vehicle (III) groups. A cross- section of heart tissue obtained from the sham group showed normal cardiac structure (score 0); no interstitial edema, no diffuse myocardial cell swelling and necrosis, no neutrophils infiltration, no hemorrhage, no capillary compression and no evidence of apoptosis. There was statistically significant difference between control group and sham group (P˂0.05) and the total severity scores of control group showed (16.7%) of the group had moderate cardiac injury (score 2), (50%) had sever cardiac injury (score 3) and (33.3%) had highly severe cardiac injury (score 4). There was statistically insignificant difference between control group (II) and control vehicle (III) and the total severity scores of control vehicle group (III) showed (16.65%) of the group had moderate cardiac injury (66.7%) had sever cardiac injury and (16.65%) had highly sever cardiac injury. Treatment of rats with L-methionine improved cardiac injury significantly (P˂0.05) as compared with control vehicle (III) group and the total severity scores of this group was such that (50%) had mild cardiac injury (score 1) and (33.3%) had moderate cardiac injury (Figure 6, 7). Figure 3. Exposure of myocytes to ischemia/reperfusion injury through LAD ligation significantly increased the ssDNA levels (P˂0.05) in the control group (II) compared to the sham group. Pretreatment with L-methionine (group IV) significantly reduced (P˂0.05) ssDNA levels when compare to the control group (I) and control vehicle group (II). Figure 4. Component bar chart the relative frequency of different histopathology grading of abnormal heart changes among the four experimental groups. Score 0 (normal), no damage; score 1 (mild), interstitial edema and focal necrosis; score 2 (moderate), diffuse myocardial cell swelling and necrosis; score 3 (severe), necrosis with the presence of contraction bands and neutrophil infiltrate; and score 4 (highly severe), widespread necrosis with the presence of contraction bands, neutrophil infiltrate, and hemorrhage. Figure 5. A representative photomicrograph of a section of the heart tissue section stained with Haematoxylin and Eosin (X 40). A, the sham group shows normal architecture (score 0); no interstitial edema, no diffuse myocardial cell swelling and necrosis, no neutrophils infiltration, no hemorrhage, no capillary compression and no evidence of apoptosis. B, cardiac section for the control group showed hemorrhage, necrosis and neutrophil infiltration. C, cardiac section for the control group showed capillary compression (black arrow), PMN infiltration (orange arrow) and hemorrhage (blue dotted arrow). D, cardiac section for the control vehicle group showed interstitial edema (green arrow), hemorrhage (blue arrow) and PMN infiltration (orange arrow). E, cardiac section of moderate injury showed diffuse myocardial cell swelling (green arrow) and focal necrosis (blue dotted arrow). F, cardiac section after treatment with L-methionine show almost normal cardiac structure. Most tissues reveal a mild histological changes (50% of this group, score 1) with only 33% showed a moderate changes (score 2). As showe in the results, pretreatment L-Methionine (group IV) significantly (P˂0.05) reduced the inflammatory cytokines (IL-1β, TNF-α, IL-6), cTn-I and ssDNA levels when compared to the control group (II) and control vehicle group (III). There is little data about the effect of l-Methionine on (TNF-α, IL-1β, IL-6) in ischemia/reperfusion injury following LAD ligation. However, Javier Arias found that S-adenosyl-L-methionine has a protective effect on hepatocytes against the in vitro effect of cytokines . Haddad et al. showed that IL-1b, IL-6, and TNF-α are up regulated when there is a glutathione (GSH) (a methionine-derived tripeptide) depletion . The present study demonstrated that L-methionine decreased the level of cytokine (IL-1β, IL-6, and TNF-α) and this may be due to the increased level of GSH or may be as a result of role of L-methionine as MAPK and NFk-B inhibitor or due to its antioxidant action . Prasad et al. demonstrated that L-Methionine is very effective in preventing ischemia-reperfusion-induced myocardial necrosis . In our result, there is a large decrease in severity score in L-methionine treated group. This may be due to an increased production of GSH, which has cytoprotective effect and free radical scavenger activity. GSH also has a role in preventing lipid peroxidation that will largely decrease the apoptosis and necrosis. L-Methionine significantly reduces the elevation of cardiac troponin I (cTnI) plasma level (P˂0.05) as compared with control group, but there is little available data on the effect of L-Methionine on cTnI. In a previous study, it was reported that cTnI has especially become important in early diagnosis of myocardial damage . Moreover, cardiac troponin level is a more specific marker than creatinine kinase (CK) and its isoenzyme CK-MB for diagnosing myocardial necrosis . In this study, we found that there is a significant correlation between level of cTn-I and cardiac injury score (r=0.554) treatment of rats with L-Methionine decrease cardiac injury so might result in decrease plasma level of cTn-I. Pretreating rats with L-methionine significantly reduced (P˂0.05) ssDNA levels when compared to the control. This may reflect that L-methionine has a protective effect on myocytes after ischemia/reperfusion injury. Armstrong showed that c-Jun N-terminal kinase (JNK) activation was observed in the ischemia/reperfusion group . Shan Lu found that the activity of c-Jun N-terminal kinase-1 (JNK-l) increased dramatically in response to methionine restriction . JNK can be activated by reperfusion. This is presumably related to the established activation of MAP kinases by ROS . Brouns showed that free radicals act as signaling molecules to induce an inflammatory response and trigger apoptosis. So when L-methionine increases, an increase in GSH level and reduction in free radicals and apoptosis would be expected. L-methionine may have antiapoptotic effects due to both actions: first on JNK and second due to anti-oxidant potential . 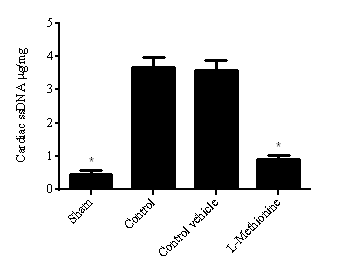 It is concluded that L-Methionine reduces inflammatory reaction and apoptosis associated with ischemia/reperfusion injury induced by LAD ligation resulting in reduction of cardiac injury induced by ischemia /reperfusion. All authors performed requirements of the manuscript. 2. Bopassa J. Chrisostome. Protection of the ischemic myocardium during the reperfusion: between hope and reality. Am J Cardiovasc Dis 2012; 2(3): 223-236. 3. Braunwald E, Kloner RA. Myocardial reperfusion: a double-edged sword. J Clin Investig 985; 76: 1713-19. 4. Fiorillo Claudia, C., et al. Curcumin protects cardiac cells against ischemia reperfusion injury: Effects on oxidative stress, NF-kappa B, and JNK pathways. Free Radical Biology & Medicine 2008; 45: 839. 5. Nasser Ghaly Yousif and Fadhil G Al-amran . BMC Cardiovasc Disord 2011; 11: 62. 6. Holly M. Brown-Borg, Sharlene G. Rakoczy, Eric O. Uthus. Growth hormone alters methionine and glutathione metabolism in Ames dwarf mice. Mechanisms of Ageing and Development 2005; 126: 389–398. 7. Kröger H, Dietrich A, Ohde M, Lange R, Ehrlich W, Kurpisz M. Protection from acetaminophen-induced liver damage by the synergistic action of low doses of the poly(ADP-ribose) polymerase-inhibitor nicotinamide and the antioxidant N-acetylcysteine or the amino acid L-methionine. Gen Pharmacol 1997; 28: 257-63. 8. Wiedemann D ,Margreiter R,Laufer G,Petzelbauer P,Semsroth S. The fibrin-derived peptide B beta significantly attenuates ischemia/reperfusion injury in cardiac transplant model. Transplantation 2010; 89: 824-9. 9. 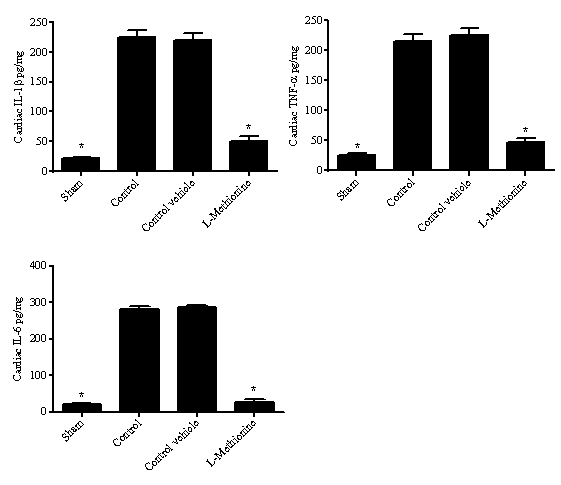 Ding JW, Tong XH, Yang J, Liu ZQ, Zhang Y, Yang J, Li S, Li L. Activated protein C protects myocardium via activation of anti-apoptotic pathways of survival in ischemia-reperfused rat heart. J Korean Med Sci 2010; 25: 1609-15. 10. Wayman NS, Ellis BL, Thiemermann C. Simvastatin reduces infarct size in a model of acute myocardial ischemia and reperfusion in the rat. Med Sci Monit 2003; 9: 155-9. 11. Bancroft J.D., and Stevens A. Theory and practice of histological techniques. Churchill Livingstone. Melbourne 1982; 2:125. 12. Zhang M, Xu YJ ,Saini HK, Turan B, Liu PP, Dhalla NS. Pentoxifylline attenuate cardiac dysfunction and reduces TNF alfa level in ischemia-reperfused heart. Am J Physiol Heart Circ Physiol 2005; 289: 832-9. 13. Javier Arias-D, ElenaVara, CruzGarc, NatividadVilla, José M.Rodr PabloOrtiz, José L.Balibrea. S-Adenosylmethionine Protects Hepatocytes against the Effects of Cytokines. Journal of Surgical Research 1996; 62: 79-84. 15. Prasad Kailash , Debjani Debnath, Jawahar Kalra and Marian Prasad.Protective effect of methionine in the ischemia-reperfusion cardiac injury in the canine mode. International Journal of Angiology 1996; 5: 93-101. 16. 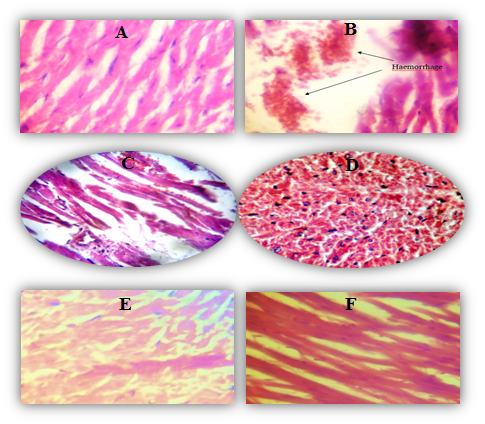 Tunca R, Erdoğan HM, Sözmen M, Çitil M, Devrim AK, Erginsoy S, Uzlu E: Evaluation of cardiac troponin I and inducible nitric oxide synthase expressions in lambs with white muscle disease. Turk J Vet Anim Sci 2009; 33: 3-59. 17. Çakıroğlu D, Meral Y, Bakırel U, Kazancı D.Cardiac troponin levels in dogs with dilate cardiomyopathy. Kafkas Univ Vet Fak Derg 2009; 15: 13-17. 18. Armstrong Stephen C. Protein kinase activation and myocardial ischemia/reperfusion injury. Cardiovascular Research 2004; 61: 427– 436. 19. Shan Lu, Sara M. Hoestje, Eugene M. Choo, Daniel E. Epner. Methionine restriction induces apoptosis of prostate cancer cells via the c-Jun N-terminal kinase-mediated signaling pathway. Cancer Letters 2002; 179: 51-58. 20. Brouns R, De Deyn PP. The complexity of neurobiological processes in acute ischemic stroke. Clin Neurol Neurosurg 2009; 111: 483-95.